New creative song album Jiri Pavlica and Hradišťan based on 6.18, will be called Seconds fragile. Album preparing a set number of years and turning fifteen tracks occurred this spring at Studio Michael. 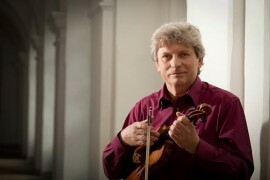 On the new album patnactiskladbovém Jiří Pavlica and Hradišťan loosely linked to his work earlier albums. Jiří Pavlica present texts set to music a number of leading Czech composers such as Michael Stransky, Dušan Vancura or Jan Skacel, who is the author of the text right track "with Sorrel Way" offer a taste here . New recording shall Hradišťan at a special concert in Wednesday, 11.06 in Prague and Vyšehraní 6.18 Sono Center in Brno. More about the album you can learn directly from Jiri Pavlica HERE . Hradišťan artistic director Jiri Pavlica is a unique body with a high artistic and interpretative levels unusually wide genre range and unconventional repertoire, which was a strong source of inspiration especially in the early days of its existence folk tradition. Today is Hradišťan (in a broader form is a dance troupe) the professional body that programmatically work with particular reference folk tradition and its philosophical overlap. It transcends the boundaries of musical genres and works with personalities from various cultures around the world. He is a frequent guest, both domestic and international festivals of traditional, alternative, but also classical music. Hradišťan cooperates with radio, television and film, performed on four continents, has made more than 30 flagship audio media and many others worked.